I have talked a bit about things that have broken or don’t work on our boat. We are slowly fixing that stuff though the list of projects grows nearly daily. However, it’s not all bad! We are having fun coming up with creative solutions for challenges (usually the No Space challenge) and here’s one that everyone seems to enjoy! It’s been established that I love to cook and an important part of my cooking are the herbs and spices that give recipes an extra little something. In our New York apartment we had two drawers (one for cooking utensils, one for eating utensils) which left no space for my extensive spice collection. 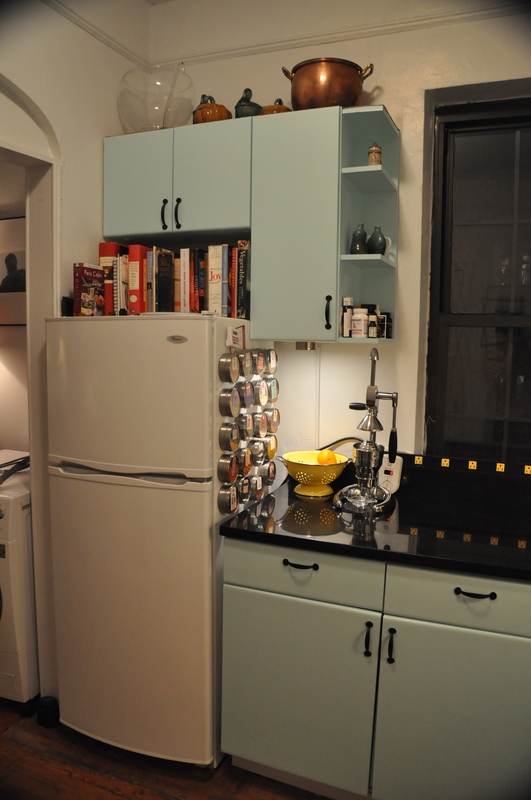 A trip to Ikea gave us the idea of sticking magnetized containers on the side of our fridge. 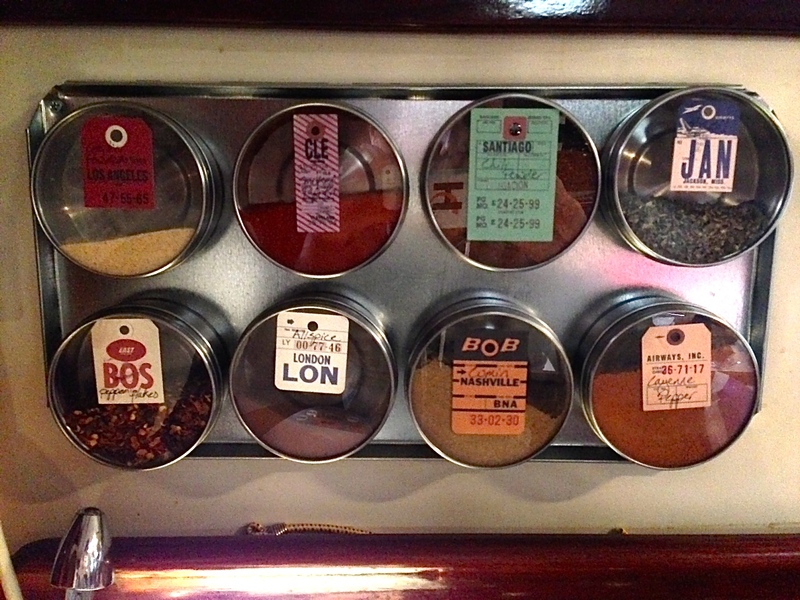 I wrote spice names on stickers that look like vintage travel tags and my favorite part (one of my favorite parts, at least) of the kitchen was born! See the spices on the side of the fridge? Handy! I brought my magnet-y jars onto the boat because I love them so – even though we have a LOT of drawer space (which I’ll show you later) – it helps me to have everything in front of my face while I’m cooking. Herbes de Provence in scrambled eggs? Sure! How about basil or smoked paprika or a touch of red pepper flakes or garlic salt or dill or… well, you get the picture. There’s no giant refrigerator or other ferrous metal plate in the galley so we had to come up with a solution. Armed with a magnet we walked around Home Depot looking for something that: we could mount on the wall, would be the correct size, wouldn’t slice our fingers if we happened to touch the edges, didn’t look terrible, oh…and was magnetic. A bit of a tall order, I thought. The solution came in the form of a galvanized steel duct cap plate. 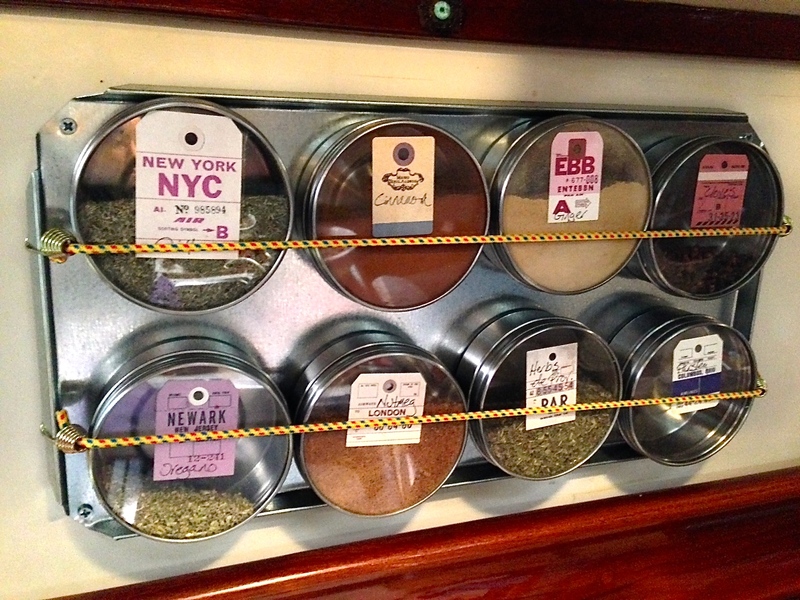 We purchased two, screwed them into the wall above the grab rail and I stuck my spices to them! To the left of the portlight. I like these containers because the lids screw down and they have a strong magnetic base. We even bought mini bungee cords to secure them in case they decide to get out of hand when we’re sailing. So that’s our nifty solution for spices and keeping cooking fun! This is such a great idea, very clever. I know of a few boatie friends who I’ll be sharing this with, thank you! You’re welcome and I’m so glad you like it! It really is handy for small space cooking!